Corporate Acquisitions of Startups: Why Do They Fail? For decades large companies have gone shopping in Silicon Valley for startups. Lately the pressure of continuous disruption has forced them to step up the pace. More often than not the results of these acquisitions are disappointing. What can companies learn from others’ failed efforts to integrate startups into large companies? The answer – there are two types of integration strategies, and they depend on where the startup is in its lifecycle. 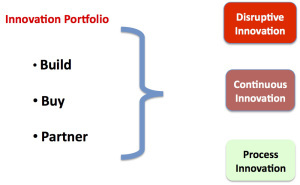 Companies manage these three types of innovation with an innovation portfolio – they build innovation internally, they buy it or they partner with resources outside their company. This entry was posted in Uncategorized on April 27, 2014 by stynger76.